Loch Lomond Distillery I unashamedly do not understand. But I am in the process of attempting to understand it, landing myself a tour there in November (report to follow I hope). What I do know is that it could be the most adaptable Scotch whisky distillery, able to make grain and malt whisky of various different styles. Loch Lomond, Inchmurrin, Inchmoan, Inchfad, Old Rosdhu, Croftengea and Craiglodge being some of the different styles. These could be from different stills and different peating levels. Nose: Lovely creamy marzipan, slightly dirty orange, some perfume, orange chewing gum, marshmallow. Complex nose. Taste: Creamy and light, delicate then orange, chewy and perfumed, orange peel, some ginger and cardamom spice. Water: Even softer, better balance and a better build up to a spicier finish. Finish: Long length. More orange chewy gum, light still but with some mouthfeel. Distillery exclusive from Loch Lomond. 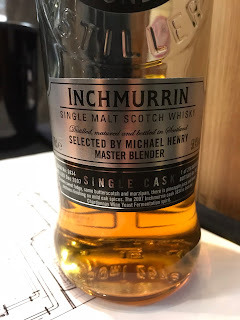 I’ve tried one other Inchmurrin in the past and remember that being good too. Need to try more from these guys. Many thanks to Ibon for the taste and the rest of the bottle, you sir are a gentleman.